This is just an example of one of available Portfolio page settings combinations. In our theme you can choose between 14 portfolio grid layout variations, fullwidth or boxed layouts, spaced or regular grid, 8 portfolio item hover animations, 18 category filter animations, and 3 column count settings. All this settings can be combined with each other that gives you unlimited design variations of your Portfolio page. Copyright @ 2008 Aquablue™ Basement Waterproofing Contractors / Foundation Concrete Crack Repair, All Rights Reserved-Reproduction of this site in parts or in its entirety without written consent prohibited. Note also all registered trademarks and copyright laws. 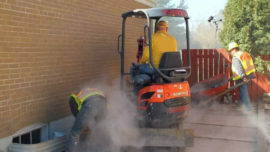 We provide basement waterproofing solutions and are leading basement waterproofing contractors providing wet leaky basement waterproofing proven solutions in Southern Ontario. Aquablue™ is committed to respecting the privacy of individuals and recognizes a need for the appropriate management and protection of any personal information that you agree to provide to us. We will not share your information with any third party outside of our organization, other than as necessary to fulfil your request.